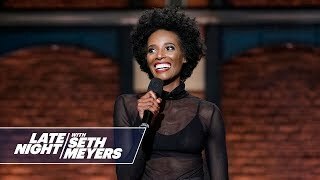 Zainab Johnson, a stand-up comedian and actress, is quickly being propelled as one of the most unique and engaging performers on stage and screen. Zainab’s comedy is based on her unique point-of-view, which was shaped growing up in Harlem as one of thirteen siblings in a Muslim family. After getting a degree in math and taking a job as a teacher, she quickly learned that she had a different calling. Zainab can most recently be seen in her breakout appearance on HBO’s All Def Comedy and has made appearances on Arsenio, BET’s Comic View, MTV’s Acting Out, AXSTV’s Gotham Comedy Live! and just recently HBO’s All Def Comedy. She has performed at the Improv Comedy Club in LA and the Comedy Cellar in NY. In 2014, she performed in the Montreal Just For Laughs Festival as one of the 2014 New Faces of Comedy as well as one of the breakout new comedians on NBC’s Last Comic Standing Season 8.